The magnetic drilling machine also popularly known as magnetic drill, magnetic drill press, magnetic core drilling machine, magnetic base drill, mag base drill, broach cutter machine, etc. is a portable and high capacity drilling machine which can also perform tapping, reaming and countersink, depending on model. Magnetic drilling machines are already well known in American and European markets, though also getting known in the Asian markets now. There have been many manufacturers of magnetic drilling machines specially in the USA, Germany, China, Japan, India, Taiwan, etc. 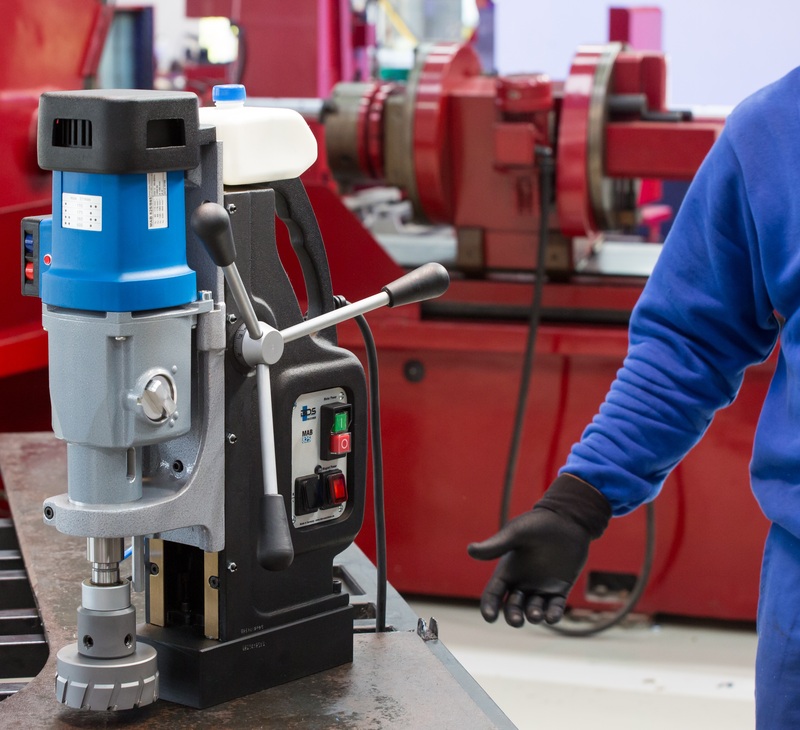 This article will give you more information about the best magnetic base drilling machine currently in the market and why it is the best. 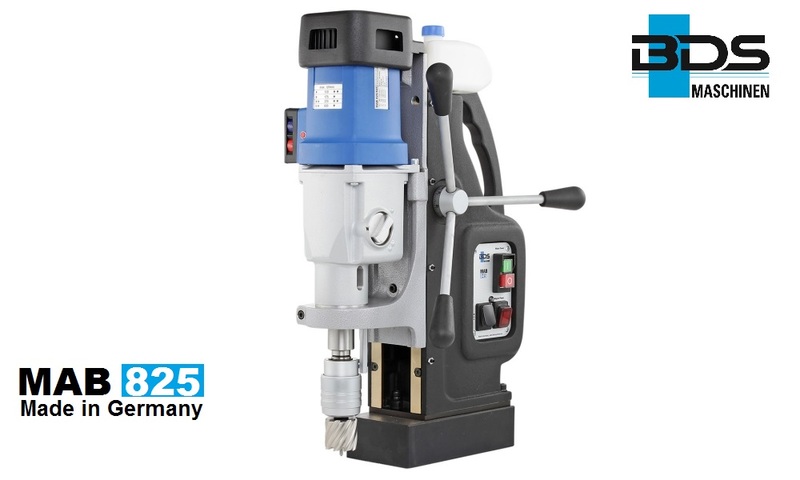 Here we present you the best magnetic drilling machine, the MAB 825 from BDS Maschinen GmbH, a 25 years experienced & specialised manufacturer from Germany. 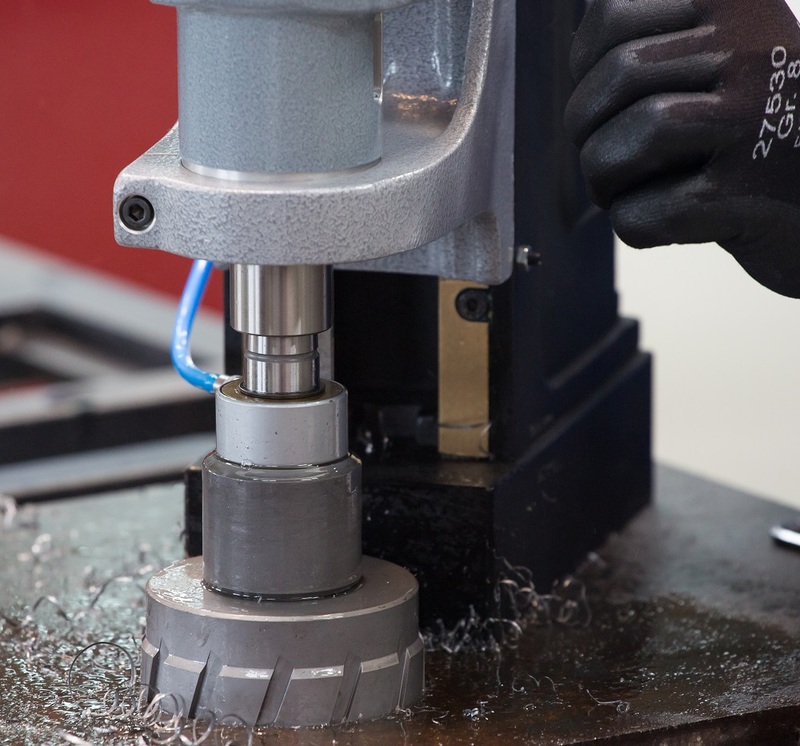 BDS is the only company in Europe which manufactures magnetic drilling machines as well as annular cutters in its own factory in Germany. BDS currently has more than 21 models of magnetic core drilling machines in its standard product range manufactured at its production facility near Düsseldorf at Mönchengladbach, Germany. Why is MAB 825 the best magnetic core drilling machine? FRICTION CLUTCH – The MAB 825 is equipped with friction clutch which helps in preventing tool breakage. 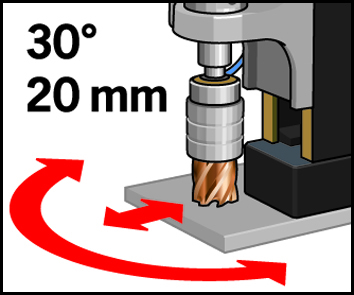 When the cutter gets jam inside the material and can no longer rotate, then the friction clutch activates and stops the spindle rotation preventing from the cutter break. 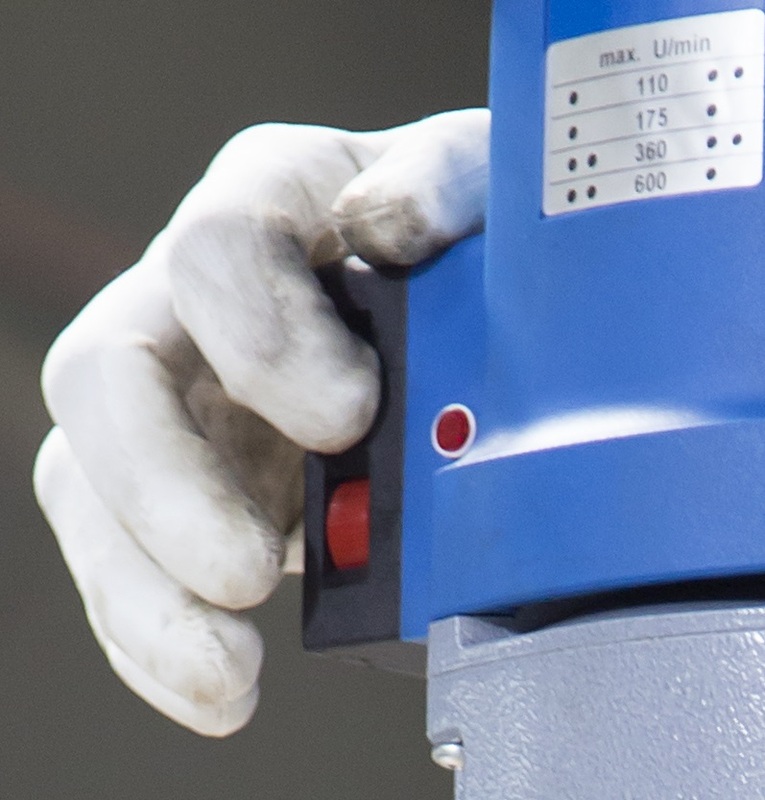 REVERSIBLE MOTOR –The unique feature of MAB 825 machine is that the it is equipped with reversible motor. A reversible motor is absolutely necessary to do per tapping or thread cutting. Once the tapping is finished, with reversible motor you can remove the taps at the entry of the holes, which helps prevent the threads to get damaged. reversible motor is also useful for right hand as well as Left hand taps. With a reversible motor there is no need of extra tap-head attachment. 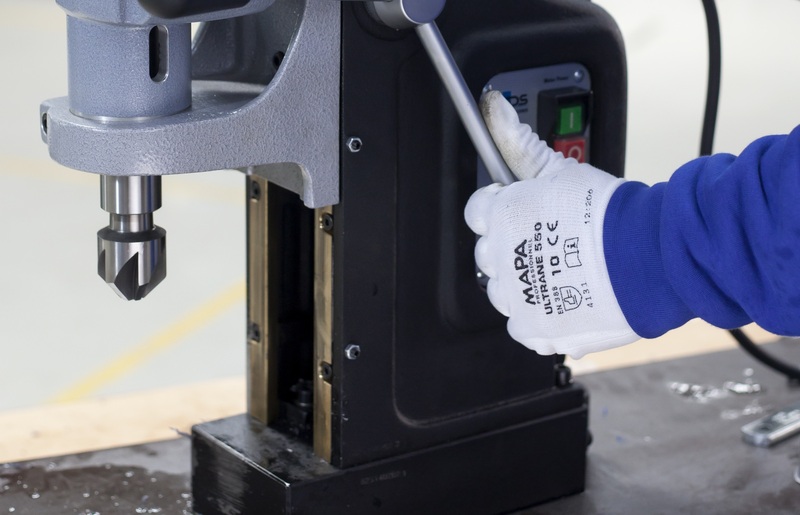 TORQUE CONTROL – The special torque control on the MAB 825 machine helps operators to get the correct required power for performing drilling, tapping, reaming or countersink. 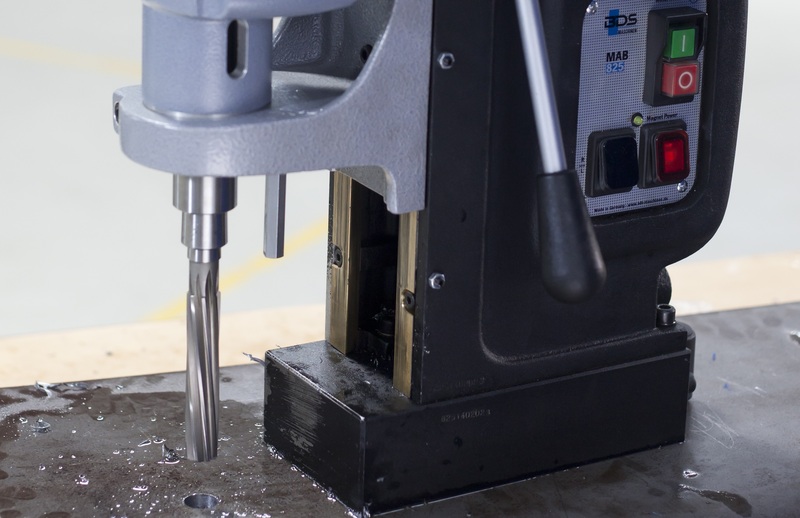 For example, unlike drilling, tapping operations require high power and low speed, this can be achieved with the MAB 825 machine. 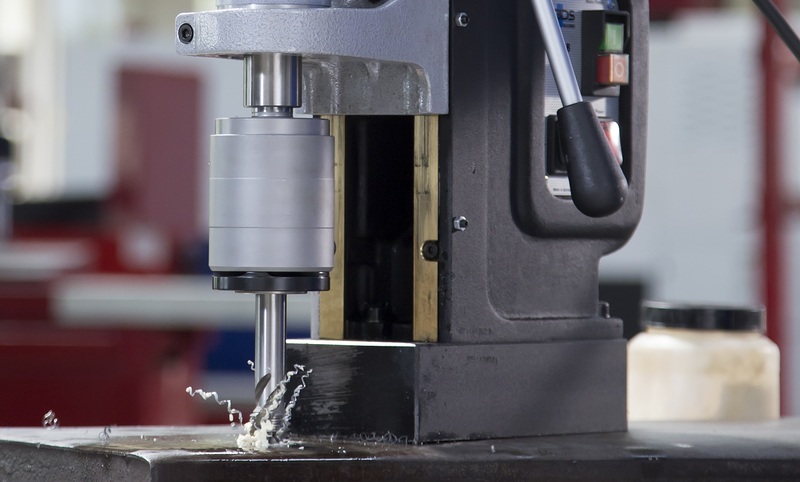 SPEED CONTROL – Variable speed control is the most essential feature for a high capacity magnetic drilling machine. This speed control helps operator to get the exact speed required for the machine as per the cutting tool size or diameter. The BDS ProfiPLUS class magnetic drilling machines are equipped with Speed & Torque control potentiometer to help you get the exact RPM and also the required torque while drilling, tapping, racing or countersinking. 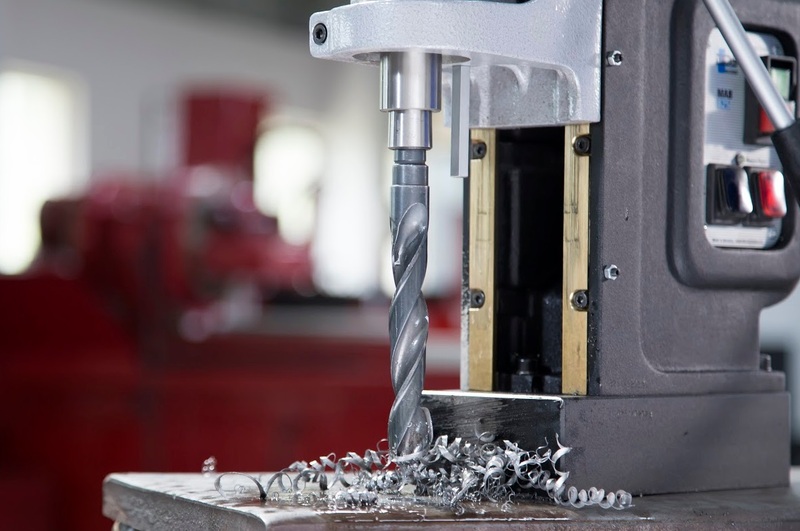 FULL WAVE CONTROL ELECTRONICS – This is the most unique feature BDS magnetic drilling machines have. A full wave control electronics makes it possible for the motor to deliver the same output as of idle motor even while drilling. 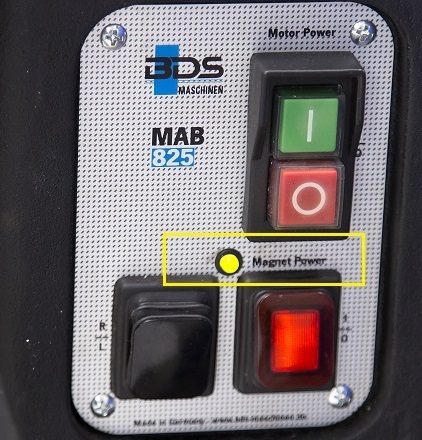 For example, the MAB 825 motor has an output of 1800 Watt in idle condition, this 1800 Watt does not fall while drilling and the operator gets the same power even while drilling. Unlike other competitors’ machine whose watt falls down while drilling, thus giving less power while drilling then described on data sheet.The electronic control ensures continuous adaptation of the motor output to the load during drilling. The advantages are high performance at low speed and a steady sequence. If load peaks should be too high, the electronic torque control will be activated in order to prevent tool breakage and avoidable damage. 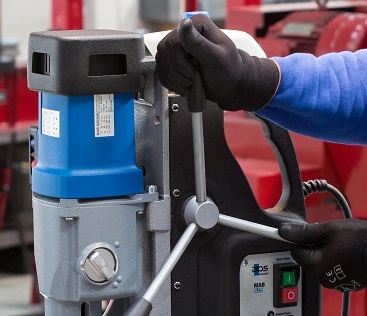 An active contribution to employee safety with BDS machines. This helps the operator to know if the machine magnet base is properly placed on the material or not. When the machine is not placed properly the LED indicator will glow and indicate the operator to place the machine correctly. The load configuration and the reserves of the electromagnet are exactly adapted for the performance of the respective magnetic core drilling machine. The user is informed by a visual control. LED Green: The magnetic adhesion meets the minimum requirements. LED Red: The magnetic adhesion is not sufficient, because it is reduced due to low material thickness or a coat of lacquer, forge scale or zinc or improper placing. 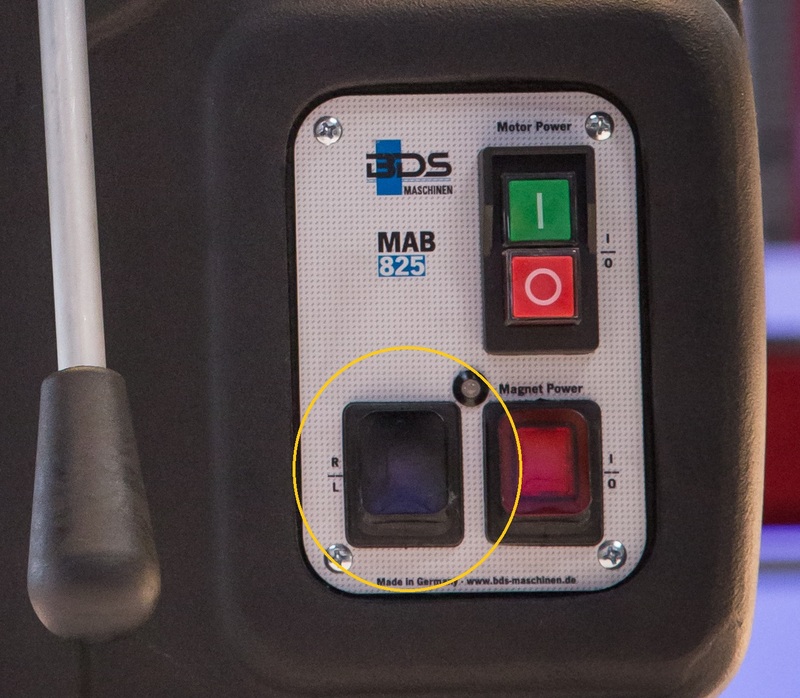 OVERHEAT PROTECTION – One of the very useful feature of MAB 825 specially for new operator is the overheat protections. Due overload or improper handling of the machine while drilling the machine may get heated and due to heat the motor may get damaged. The BDS magnetic drilling machines protects the machine from overheat by shutting down the motor when the sensors senses overheat, this prevents in damaging of the motor. 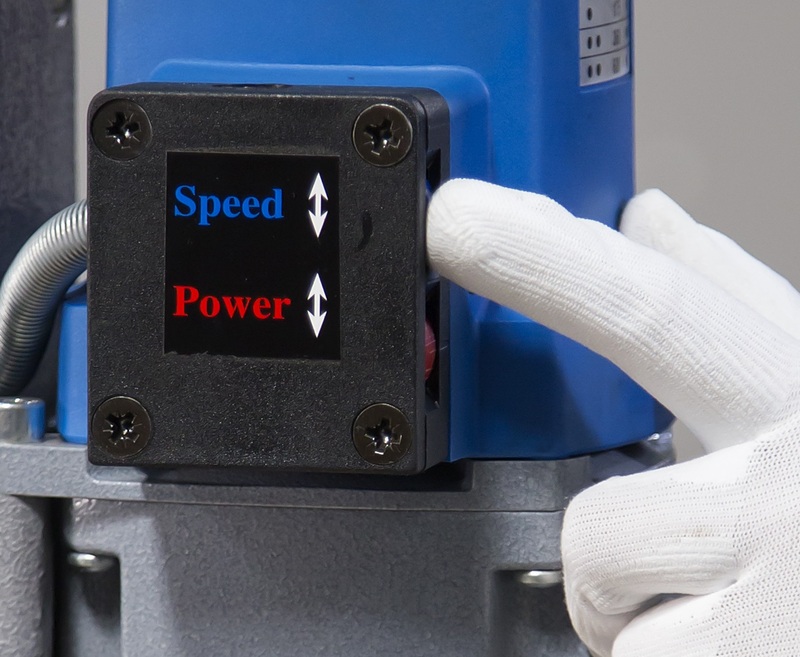 After the motor is shut down by the overheat protection, keep the machine idle for 30 seconds to 1 minute and then run the run the motor again without drilling. Run the motor for a minute and then start to drill again. This feature increases the machine service life as well as avoids accidents. CARBON BRUSH WEAR INDICATOR – The most innovative feature in the MAB 825 magnetic drilling machine is the carbon brush wear control indicator. Its often seen that brush motors get damaged due to defect in armature, an armature is defected when the carbon brushes are not changed in time. One can know if the carbon brush is worn ou only by the change in sound of the motor, which is not so easy to know. 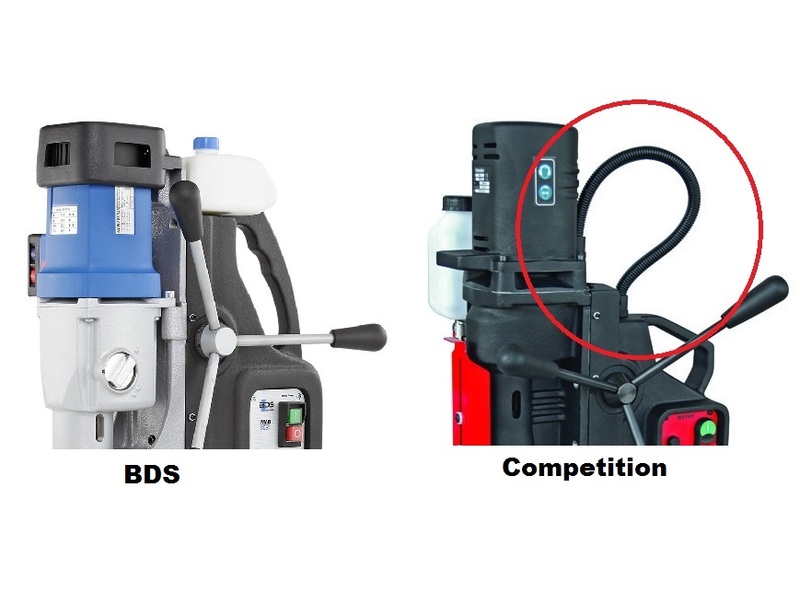 The carbon brush indicator on the BDS machines solves this problem. 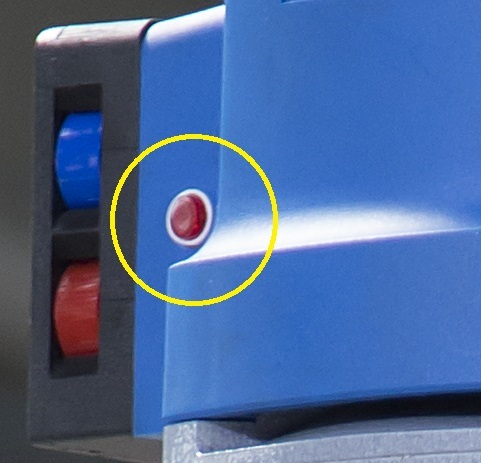 When the carbon brush is ”about to” get worn out, this indicator glows a red light and informs the operator that soon he has to replace the carbon brushes. the indicator give advance indications so that the operator can order new carbon brushes without stopping his work with the machine. Correct change of carbon brushes on time increases the life of the armature and thus increases the service life of the magnetic drilling machine. OIL BATH GEARBOX – The motor gearbox of the BDS magnetic drilling machines are made of oil bath unlike the grease or fat gearbox from other manufacturer. The disadvantage of grease or fat gearbox is that when the grease is in Solid state the gearbox the completely filled with grease but, after working with the machine the gearbox of the machine gets heated up changing the solid state of grease to liquid state. 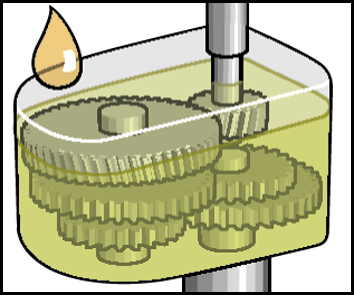 In liquid state the level of grease decreases and there is no lubrication for the upper gears, which thus in time damages the gearbox. The advantage of BDS oil bath gearbox is that oil in cold or hot temperature is always in liquid state, hence oil always provides lubrication to upper as well as lower gears, thus increasing the service life of the machine drastically. Unlike other manufactures machine where the cable from motor to the housing runs externally, inviting accidents, the BDS magnetic drilling machines have complete internal cabling. the motor cable running from motor to the housing is mounted inside the machine and not external. Due to no cable outside there is no mishandling of the machine or no accidents due to external cable coming in way. 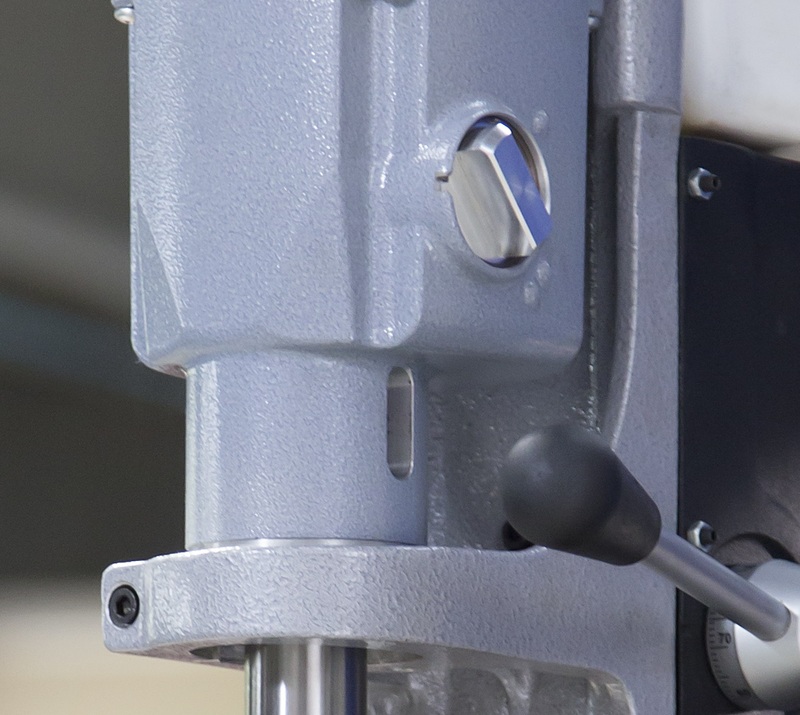 SWIVEL BASE (optional) – The MAB 825 magnetic drilling machines can also be bought with a Swivel Base option (the model is then called MAB 845). 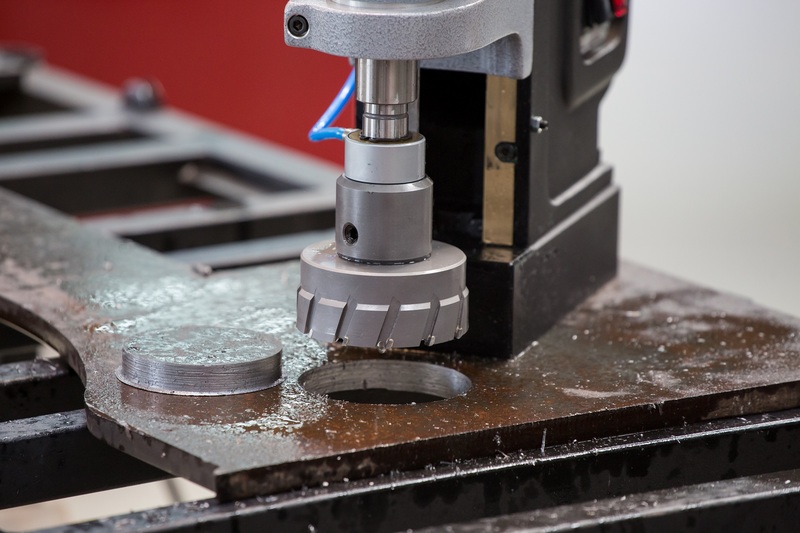 The Swivel Base is an adjustment device on BDS magnetic core drilling machines, which helps the operator to position the machine ”even under magnetic condition.” The operator can move the machine 30° left or right and 20 mm backward or forward that too when the magnet is activated. This is a useful when drilling multiple holes close to each other (like on boiler plates) or when drilling in vertical position or overhead position. WEIGHT – Just 25 Kg. MADE IN GERMANY – The MAB 825 is 100% made in Germany machine giving 1 year international warranty and 2 years warranty in Germany, on the complete machine. Next Next post: How to select annular cutter?